if you haven't noticed, wedding planning has been keeping me super busy lately. i really just want to be able to enjoy the engagement period mapping out details, making phone calls, & preparing to be a wife. at this point we just need a date and a place. that's it. then we can relax for a few months before diving into the rest of the preparations. in the past week, we've visited more reception venues than i can count on two hands. so far, none of them have really jumped out at me. but i know one will. i will know "that will be the one". that will be where we have our first dance as husband and wife, where all of our family and friends will celebrate with us on our most special day. i can't wait until i know. matt & i received a lovely engagement gift that i just had to show you. it is so perfect for any newly-engaged couple. 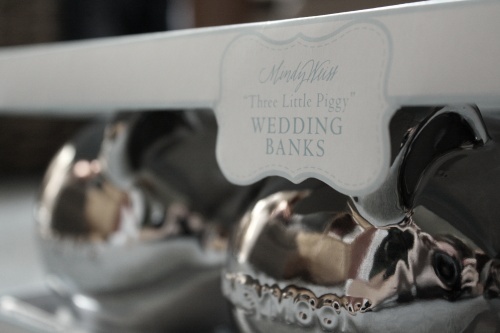 mindy weiss has some beautiful wedding gifts in her estore, and i think these piggy banks are just darling! and each piggy says wedding, honeymoon or happily ever after. these little guys will keep me company until after the wedding, when i will pass them on to the next engaged friend! what a perfect gift.